A wood fence could be a nice addition to your landscape. Are you thinking about purchasing a fence for your yard? Fences can be an excellent addition to practically any landscape. Some of the most popular fencing materials include aluminum, PVC, wrought Iron, vinyl, chain link, and of course, wood. Wood fencing a traditional option that can provide a yard with a classic appearance. 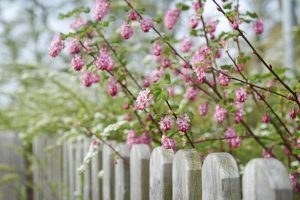 If you have a wood fence or are thinking about investing in one, here are some commonly asked questions. Why Should I Stain It? Many homeowners decide to stain their wood fence because it can prevent weathering and water damage. A great thing about stain is that can easily be reapplied every couple of years to help your fence retain its appearance. What Can I Do To Maintain It? Unlike some of the other fence materials, wood is susceptible to weathering. Over the years, a wood fence is going to discolor and may even warp. As stated above, staining your wood fence is an excellent way to extend the life of it. Before you stain it, you must give it a thorough cleaning in order to achieve the best results possible. An easy way to clean your fence is to use a cleaner with a scrub brush. If your wooden fence is very dirty, you may need to use a pressure washer. If you decide to use one, just be sure that you don’t spray it too close to the surface because you can damage the wood. How Tall Should It Be? Before you decide on a fence, it is important to consult your area’s homeowners association. There may be restrictions on how high your fence should be. In some cases, fences cannot exceed 6’; however, this varies by area. Be sure to do your due diligence and ensure you know the regulations within your neighborhood. No matter what type of fence you have decided on, Hercules Fences has the expertise and equipment to construct your dream fence. Our experienced team can help meet your fencing needs, whether they are residential or commercial, for the right price. We proudly serve Albemarle County, Amelia, Ashland, Augusta, Buckingham, Caroline, Charles City, Charlottesville, Chester County, Chesterfield County, Colonial Heights, Cumberland County Dinwiddle County, Fluvanna County, and Fort Lee, Virginia, VA. Give us a call at 804-752-7992 or visit us online. To see examples of our work and keep in touch, don’t forget to follow us on Facebook, Twitter, Google+, LinkedIn,Flickr, and Pinterest. This entry was posted on Monday, July 23rd, 2018 at 9:35 am. Both comments and pings are currently closed.